On Friday Monica and I flew to Indianapolis, Indiana to participate in a "World News & Prophecy" seminar sponsored by the UCG-Indianapolis congregation on June 17, 2006. As a contributor to "World News & Prophecy" I was invited by Darris McNeely, Managing Editor of the publication, to join him and Melvin Rhodes, a Senior Editor of WNP, in presenting the seminar. The seminar was hosted by the UCG-Indianapolis church at its regular meeting hall, and it was obvious to this visitor that the congregation is a friendly, motivated and well organized group. 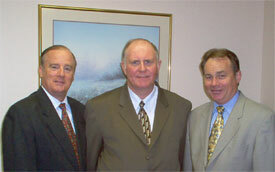 The three of us each gave two "lectures" making a total of six. For the morning church service, Melvin and I each gave one of our presentations as a split sermon. Melvin’s topic was seven reasons why the return of Jesus Christ could not have been prior to our time, and my subject was Europe’s growing dependance on foreign sources of energy and its prophetic implications. Darris had told me that I was to be the first speaker in the morning, but somehow I did not realize that I would be introduced immediately after the church service started. So I fumbled around in my folder for my notes and went to the lecturn with the wrong set of notes. But it was a Powerpoint presentation, so I was able to "recover" and use the screen as an occasional reference point, since I knew pretty well what my outline was. After the morning church service we had a break for lunch, provided by the local Indianapolis congregation for the 180 people in attendance. Subway sandwiches were the main fare, and when I jokingly asked whether Subway promoter Jared (the fellow in the commercials who lost all that weight) would show up, I learned that he is actually from Indiana. The lunch break provided an opportunity to chat with people and answer a couple of questions resulting from the morning service. In the afternoon Darris kicked off the first of the four seminars by discussing the "Pride of Power", dealing with an ancient prophecy given in Leviticus 26:14. 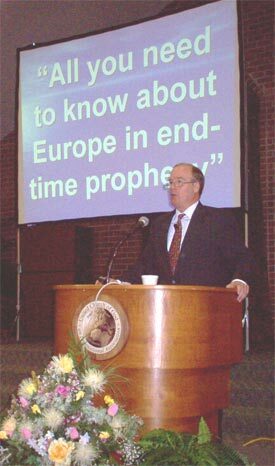 I spoke after Darris on the subject of Europe in end-time prophecy, comparing Daniel 2 with Revelation 17. Then it was Melvin’s turn again. His subject was "Nation shall rise against nation", showing the importance that ethnic identity still has in the end time. Darris then gave the day’s final presentation entitled "The King of the South, Another Look", a review of a key prophecy in Daniel 11. The all-day seminar provided a wonderful opportunity to meet new people and see some old friends. 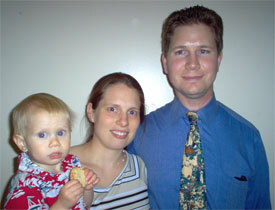 Matt Fenchel came over from Cincinnati, as did Terri Eddington with her son, mom and dad. I met an old "cyber-friend" in person for the first time, Ralph Giddens, from St. Louis. He and I used to be active on the Compuserve Religion forum during the transitional period some 10 years ago or so. And we were happy to see the Rothenbacher family – Joseph, his mom Grace and dad Carl. The Rothenbachers had just been in Germany for the spring Feast, and they will be returning to Germany to observe the Feast of Tabernacles with us in Schluchsee. We look forward to seeing them again soon! Thanks to everyone in Indy who made the day so delightful and successful, and if you ever read this, Darris, yes, I am interested in participating in another WNP seminar.